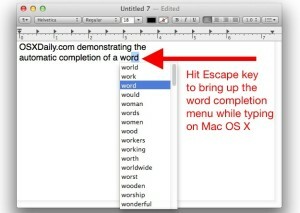 The Mac has a built-in word completion and word suggestion feature that is intelligent and works incredibly well. This OS X feature is not quite predictive text or QuickType like exists in iOS, but it’s fairly similar and all you need to do is give it a start. You’ll find this very useful if you can’t remember how to spell a word, or a word is on the tip of your tongue and you know it starts with a particular letter or prefix. You’ll find this in almost all Mac apps, especially ones from Apple. Thanks for the great tip Ohari! This continues to work in ALL versions of OS X, from OS X Yosemite, Mavericks, Snow Leopard, Leopard, Tiger, Cougar, or whatever the other wildcat names were form yesteryear. The only difference is whether you need to hit simply the Escape key, or Option Escape, that is dependent on the version of OS X you’re using, so if it’s a modern version of OS X, just hit Escape, if it’s an older version of OS X, try Option+Escape instead. Happy typing! I don’t know if I’d call this word completion, it’s more of a dictionary really. Eitherway it is a great tip, thanks! but what i want to know is why this isn’t promoted or advertised more by Apple for such a useful feature why not include it in marketing pitches? does noboyd care? 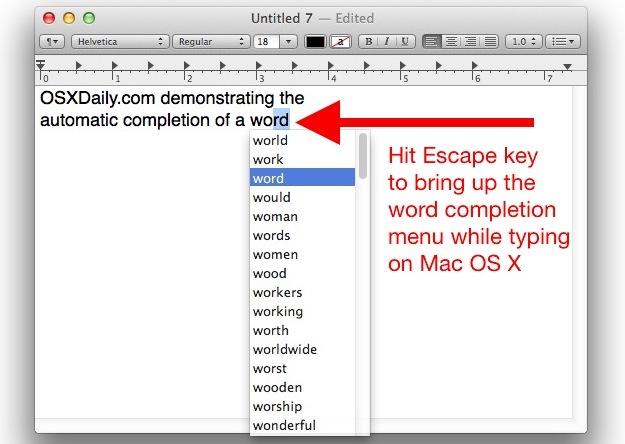 In TextEdit, you just have to press “Escape”. Apple Escape on Intel Macs though is the default into front row.